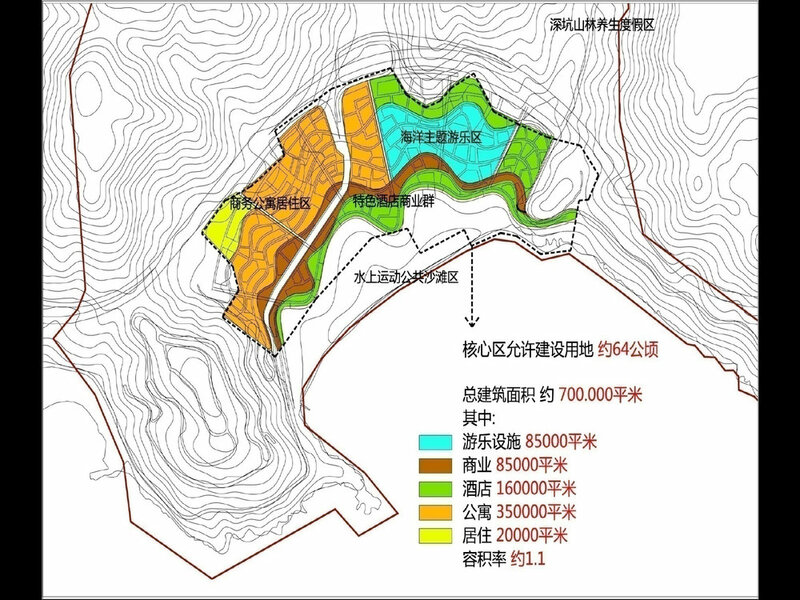 Shenzhen Xiaomeisha is close to the urban area, with convenient transportation and high tourism business value. Based on the superior conditions of the site and the mountains and the sea, our goal is to maximize the capacity of the construction community in the mountains and the sea, and realize the transition between mountains and seas.From the perspective of urban morphology, we conduct multi-layered value construction through research on the historical issues of property rights, future business directions, and construction costs, achieving consensus on multi-values.The ladder-like layout connects the mountains and seas with a more natural transition, and the curved ladder more naturally flows like a sand dune. Using the elevation difference combined with the topography of the observational ladder, the curve provides a multi-view angle and the longest viewing surface. The new lane adapts to the terrain and connects with the planned road at different elevations into a complete vehicle system. The pedestrian system combines curves and connects various scenic spots. The traffic system and curves are superimposed to create a complete and homogeneous urban texture. The curved platform type form and traffic system can be adapted to different trunk road settings.Parking garages and marine parks that accommodate a large number of people are placed in the underground and semi-underground parts. Commercial commercial entertainment is as close as possible to the coast, and the best upper part of the landscape is left for coastal living, which maximizes the advantages of the coastal landscape.The ubiquitous courtyard garden brings sunlight to all spaces in the underground garage. The landscaped water gallery connects the Pinnacle Lake Reservoir and the sea. The two green corridors open the Dawoding on the northwest side and the deep pit valley on the northeast side to the sea. Observation line of sight. In order to reflect the value of Xiaomeisha's “sand”, we have boldly balanced public beach and privatization. There are both quiet and independent private beaches for hotels and residences, as well as public beaches equipped with commercial entertainment and water sports facilities. Fully meet the needs of different users.